I'm a fan of always making my nails look like it's time for a party. Who cares if New Year's Eve is almost a year away -- there's no reason you can't have a little glitz and glamour year-round! 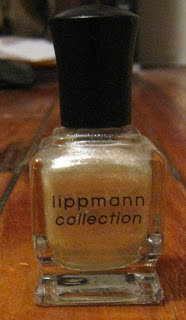 So I was totally psyched to find the gorgeous Deborah Lippmann Believe Nail Lacquer. Created with Cher -- who I'd say knows a thing or two about glitz and glamour -- it's the perfect shade of golden shimmer to really make your nails stand out. With only two coats, each of which slicked on quite easily considering that I normally have quite a bit of trouble making sparkly polishes adhere correctly to my nails, my hands were totally transformed! The sparkle factor was high, the glimmer was out-of-this-world, the shine was seriously unbelievable. And far from looking costumey, the color really looks appropriate for both the office and a dance club! And now, enough writing -- I have to take these nails out on the town! Deborah Lippmann Believe retails for $18 at beauty.com. I do too! :) I think they're always appropriate!